Han Ga In who is starring in MBC drama The Moon that Embraces the Sun (The Sun and the Moon) was holding the script on the filming set, preparing to start shooting. On January 18th, 2012, the agency of Han Ga In, Joneplus Entertainment, released a series of Han Ga In photos when filming The Moon that Embraces the Sun through Facebook and Twitter. 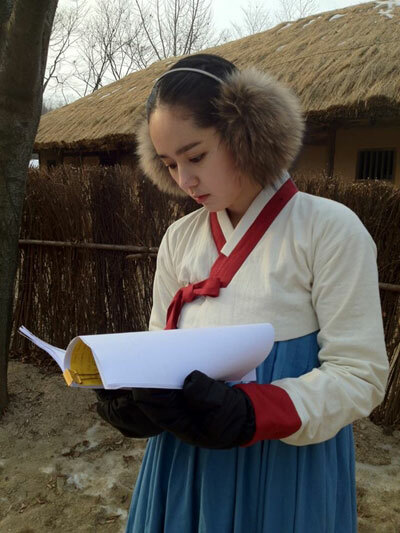 In the photos, Han Ga In was holding the script that is filled with all kinds of tips, and was seriously memorizing. Because of the cold weather, Han Ga In wore furry earmuffs and gloves that made her looks like an elf, attracting attention. Netizens who saw the photos commented, "Self luminous beauty of Han Ga In," "Very suitable to wear hanbok, really want to see the look of adult Yeon Woo," and so on. Han Ga In is playing the lead female character Yeon Woo in The Moon that Embraces the Sun, and will debut on episode 6 broadcast on January 19th together with Kim Soo Hyun and Jung Il Woo.